A Los Angeles based animal welfare group that provides free spay, neuter and pet adoption services is travelling the country looking for the best surfing dog in America. 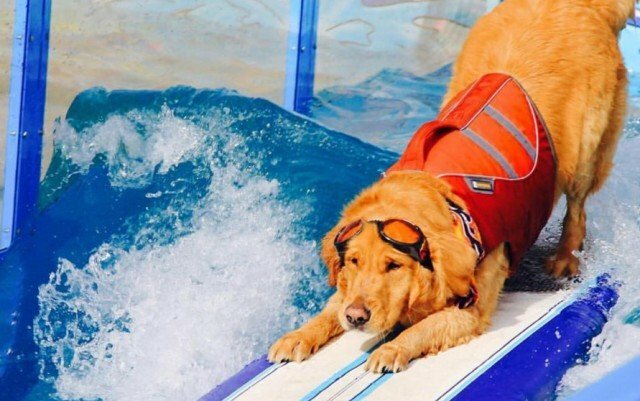 The Lucy Pet Foundation plans to cover some 30,000 miles with a mobile wave pool searching out that K-9 who can shred the waves like a pro. The try-outs are part of a national search for a mascot on the non-profit’s Rose Parade float in January 2017, which promises to be a bigger and better than their mobile wave pool. Until then, doggies with a penchant for hanging ten are having a blast trying out their skills in what’s called the they call the Lucy Pet’s Gnarly Crankin’ K-9 Wavemaker. The group recently attended America’s Pet Expo in Costa Mesa, California in search of the country’s best surfing pooch. So near to Huntington Beach it’s likely more than a few dogs in Orange County know how to surf. After all the city hosts the Surf City Surf Dog Contest each year.